Clearly, there’s no better song to introduce this natural beauty buff and her favorite green beauty things. Meet Leah Klasovsky, Mermaid-in-Chief of Kauai-based Leahlani Skincare. A holistic aesthetician-turned-maker, Leah was inspired to create her own line after struggling with cystic acne and searching for healing. With Leahlani Skincare, she promises sensory-based bliss, and she delivers this “from my loving hands to yours” — a unique handoff of that both empowers and inspires you to take joy in your self-care rituals. 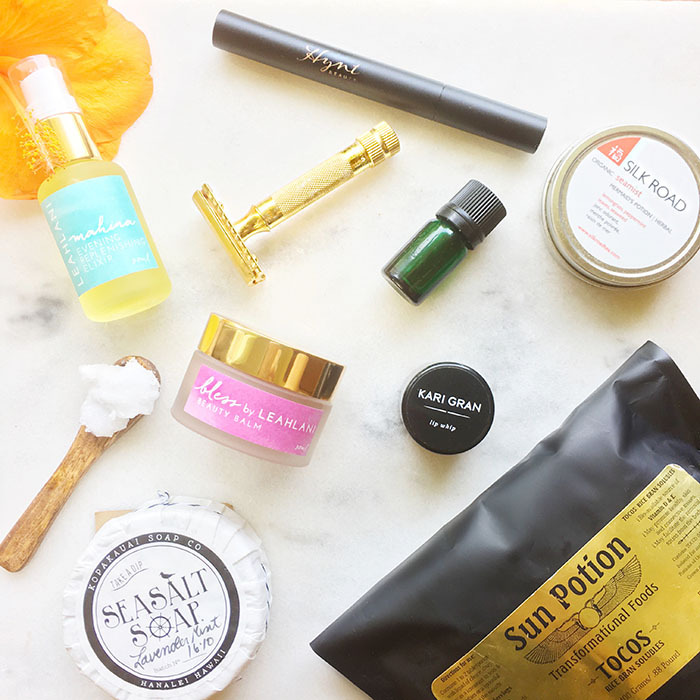 When it comes to her own self-care rituals, Leah finds delight in all aspects of beauty. Her picks below range from simple essential oils to complex herbal treats. From my glowing screen to yours, I hope you find inspiration in Leah’s favorites! *Indicates that I also use and love! Made by the loving hands of my sweet momma and poppa. I was never a bar soap girl until I tried the Kopa Sea Salt bar… life changing! This soap is not a super sudsy soap. It foams up into a rich, coconut cream that cleans like a dream and leaves your skin soft and nourished. It is one of those things where once you have tried it, you won’t be without it. Trust me. I love the Coconut and Lavender Mint the best. I love this stuff! I love the texture, the light tint and mild peppermint scent. It leaves my lips soft and supple, and there is something so joyous about unscrewing such a beautiful little jar. Mine lives in my purse, and I enjoy it every single day. Aloha Kari! This tea is so refreshing. It was gifted by a dear friend it was love at first sniff. I love everything about it — the cute little tin it lives in, the name, the scent and taste. It is a beautiful blend of lemongrass, peppermint leaves and seaweed. It is light, crisp and invigorating. I have made it iced and hot, and love it either way. This was given to me by the sweetest woman on Kauai. She distilled the ylang ylang from flowers on island. We use this very blend in our beloved Mermaid Mask, and I keep the bottle, with a few drops left, to open and sniff every time I need a moment of pure zen. It is unlike any ylang ylang I have ever smelled before. It is floral, but smells of Kauai Earth, which is my favorite scent in the universe. Pure magic. These are my must haves. They live on my bed stand and are they are part of my evening ritual. I crawl under the covers and pump 1-2 pumps of Mahina Elixir into my palm and apply to my face, neck and décolleté. I spend a good minute massaging her into the skin. Then, I emulsify a dollop of Bless between my fingertips and gently ‘press’ into the skin. I always apply Bless around my eyes and lips and use a small amount as a hand cream. The combination of these two is pure bliss. The scent is heavenly and my skin is always left feeling soft as silk. OK, first of all — it is gorgeous. I mean, it’s gold! I am a razor girl; I shave every single day. Shaving is something that I never put much thought into. It is something that I just do every day — part of my routine. I was gifted this beauty by the lovely Sarita, and it completely transformed my shaving routine into a ritual — and I am all about that. It fits perfectly in my hand and glides effortlessly, and gives the best shave ever. My legs have never been so soft. Because the razors are sharp, I take my time and am mindful. I absolutely love it. I admit, this sat in my cupboard for a long time. I didn’t know what to do with it and assumed that it was something to add to a smoothie. One day, I poured myself a glass of orange juice and decided to add a scoop. It mixed beautifully — no clumps at all — and it transformed my glass of OJ into a rich, creamy glass of love. It tastes amazing! This is one of my all-time favorite treats. I love coconut oil. I eat a teaspoon a day to help give me a boost of energy and keep my skin nourished from within. I always add a teaspoon or two to my rice pot to create the yummiest coconut rice in the world. (One teaspoon of coconut oil and pinch of Hawaiian Alaea Sea salt = heaven.) Or, I add a heaping spoonful to my smoothies. I love everything about this superfood. There isn’t one specific brand I recommend; just make sure it is raw and organic. Beauties, if you need a new cosmetics bag to carry all your loot, don’t miss out on Shopbop’s big sale this week. Use code MAINEVENT16 to get up to 30% off your haul through Friday!